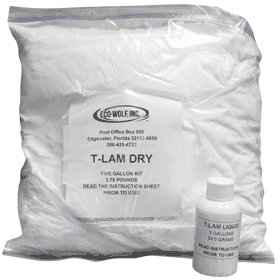 ECO-WOLF, INC.'s T-LAMTM is the ultimate laminate for AL-TOOLTM, as it utilizes the same ISO or Vinyl Ester resin. Other laminating reinforcements made from Poly Ester resin over time will cause blistering. T-LAMTM gives excellent air release, wet-out, greater structural strength and no print-through. These properties promote extended tool life and allow for chopped strand application without the loss of tool quality, thus proving to be very cost-effective.